Arrival at Istanbul airport. You will be met and transferred to your hotel by Orion staff or guide. Following breakfast, we drive to the ‘Old City’ where we visit the Hippodrome, the Blue Mosque, famous for its delicate blue ceramic tiles, and Haghia Sophia. This church – turned mosque – turned museum takes the breath away with the sheer architectural size of its interior and magnificent dome. Next we visit the spectacular Topkapi Palace that was built on one of the seven hills of Istanbul. This huge complex commands views of the Sea of Marmara, the Bosphorus and the Golden Horn. It was the seat of government for the Ottoman Empire for many centuries (1453-1852). We see the extravagant Treasury, the priceless Chinese porcelain and more. Our morning starts with a visit to the aromatic Spice Bazaar, where the smells of cinnamon, cloves and thyme, rise from hundreds of colorful muslin bags at every store front. We then board our ferry boat for a relaxing cruise along the shores of the legendary Bosphorus, the natural gateway that divides Asia and Europe. As you sit back and may enjoy Turkish coffee or well brewed tea from traditional small cups, numerous summer palaces and palatial homes will pass by on either side. Disembarking at the northern end of the Strait, we enjoy our lunch at a local fish restaurant before we proceed to Kariye (Chora) museum to see the marvelous mosaics of the late Byzantine art. The last stop will be Grand Bazaar which is amongst attractive shopping centers and the biggest “souk” in the world with nearly 4000 shops of antiques, gold, jewelry, carpets and leatherwear. After an early breakfast, we will begin our scenic drive down to Gallipoli, historically famous for being the site of many battles during WW1. Then we will visit Anzac Cove, Ceremonial Ground for Dawn Service, Lone Pine and some shelters and tunnels before we cross the second strategic waterway, the Dardanelles, and land in Asia and proceed to our hotel in Canakkale for the night. Dinner and overnight. Altar of Zeus, Temples of Dionysus and Trajan and the 200,000 volume library which was surpassed only by that found in Alexandria at the time. Leaving Pergamon behind us we settle at our hotel. Dinner and overnight. Following an early breakfast we will proceed and arrive at the ancient city of Ephesus. Ephesus was undoubtedly one of the most important cultural centers of the ancient world. Impressive structures, we will see, include the Library of Celcius, Temple of Hadrian, Theater and Odeon. We will also stop by at the Temple of Artemis which was one of the Seven Wonders of the antiquity. Close by is the House of the Virgin Mary where she is believed to have spent her last years. On August 18, 1961, Pope John XXll proclaimed the House of Virgin Mary at Ephesus to be sacred. Pope Benedict XVI paid a visit and led a Mass at the church in December 2006. You will have a chance to take some of Holy Water from the Sacred Spring. Leaving our hotel early after breakfast, we will journey to Pamukkale but on the way we include the tour of Aphrodisias. This city was famous throughout the ancient world for her temple of Aphrodite and enjoyed great prosperity during the Roman period. Some of the highlights will include the Stadium, the Baths of Hadrian, the Odeon and the Theater. 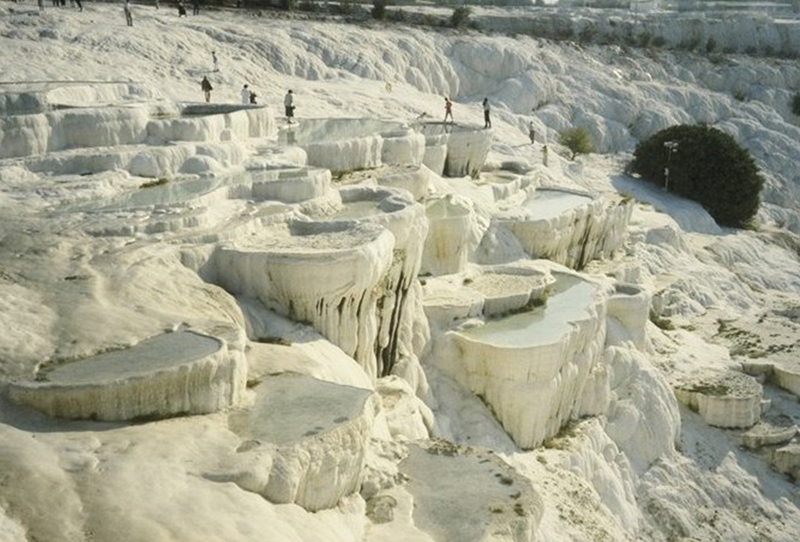 We continue on to Pamukkale where the thermal water flows from natural pools in white terraces. The ancient city of Hierapolis was named after Hiera, wife of the founder of Pergamon. Highlights include calcified terraces, the Roan Baths, the Temple of Apollo, the Nymphaeum and the famous Necropolis. Dinner and overnight in Pamukkale. We leave our hotel straight after breakfast and begin a long and scenic journey towards the sparkling Turquoise Coast. A leisurely visit to two ancient cities situated close to the hotel. With its architectural and archaeological wealth, Perge is one of the most interesting remains. Even though there is not much left to see on the Acropolis, there are wide porticoed streets, lined with many fine buildings, market places, a gymnasium and a beautiful Roman bath. Next on our itinerary is Aspendus whose theater is the best preserved in the ancient world with marvelous acoustics. Two of the other highlights will be the stadium and the aqueducts. Check into our hotel in Antalya, Dinner and overnight. Our optional tour for half day will be the magnificent archaeological museum for the finds from Perge and other ancient nearby cities and a walking tour in the Old Town in Antalya. Our trip today will take us over the beautiful Taurus Mountains into the mainland toward Konya, the center of the Seljuk Empire, with many examples of Turkish Islamic art and architecture. Konya is situated in the midst of a wind swept plateau at an altitude of 1016 meters, and the city is so old that a small hill has been excavated here containing the bones of Bronze Age Man. We will be visiting Mevlana museum, the center for Whirling Dervishes, one medrese of Karatay or Ince Minare before checking into our hotel. Dinner and overnight. We proceed to Cappadocia but on the way we stop by Sultanhani Caravanserai on the famous Silk Road. We then journey into Cappadocia and visit an underground city (Kaymakli or Ozkonak) which goes down to two to eight different levels into solid rock. The sights of the Fairy Chimneys at Pasabag Valley are phenomenal, especially when seen for the first time. The natural wonder of Cappadocia is a result of volcanic deposits being eroded away by wind and water over millions of years. These soft rocks were hollowed out by early Christians and used as secret dwellings as they were being sought first by their Roman persecutors. We will also visit many churches in Goreme that have been decorated with vivid frescoes, which have withstood the corrosive effects of time. Cappadocia is also well known for pottery, ceramics and tiles and carpets as a weaving center for centuries. We check-in to our hotel for two nights of relaxation. Dinner and overnight. We start our return journey from Cappadocia early in the morning and head towards Ankara. Ankara is the capital of the Turkish Republic and its history extends back as far as the 8th century BC. Here we will visit the Museum of Anatolian Civilizations and the Mausoleum of Ataturk (1881-1938), founding father of the Turkish Republic. Check into our hotel in Ankara. We enjoy a scenic drive over the mountains to Istanbul and cross over the Bosphorus suspension bridge to European side again where we check in and leave the rest of the day at leisure. You may begin packing or else stop by Grand or Spice Bazaar for your last minute shopping. The new town center also offers some easy walking distance possibilities. We could all get together on our last night for a farewell dinner at a nice and exclusive restaurant in order to enjoy Turkish kebab delicacies. 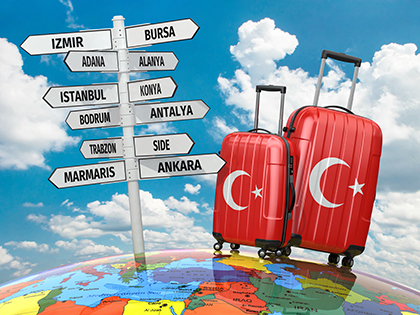 Free until we transfer you to the airport for your return flight home with sweet and unforgettable memories of your stay with us in Turkey.